Brett wasn’t a big fan of high school and knew that he wanted to find work in a trade. When the opportunity to take part in the ACE-IT program (now Youth Train in Trades) became available, he jumped at the opportunity to finish attending high school early and begin working on getting the training he needed to work in a skilled trade. The Youth Train in Trades program provides the opportunity for high school students to take courses that give them both high school graduation credits and a head-start toward completion of an apprenticeship program. It is available for students in grade 11 and 12 who know they want a career in a skilled trade. 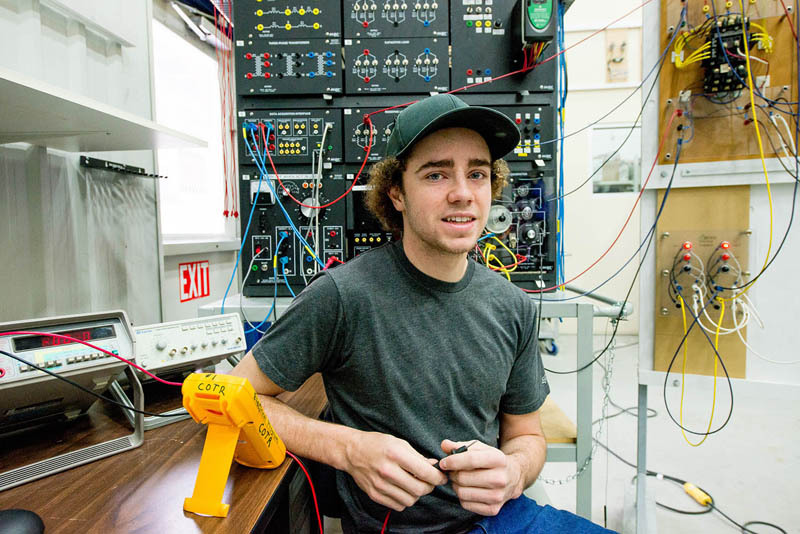 Brett began the foundation-level Electrical program very shortly after he turned 18. Now, under a year later, he has completed his foundation program with an 89% average and is a part of the College’s Mining Apprentice Program (MAP), getting apprenticeship training at the mines in the Elk Valley. MAP is designed to train participants for positions/careers as Heavy Duty Equipment Technicians and/or Industrial Electricians. Apprenticeship work experience takes place at Teck Coal Limited’s mines in the Elk Valley under actual operating conditions. The College recruits to this program as the need arises and the apprentice work experience opportunities become available. Students must go through a hiring process with many applicants for a few coveted spots. Positions became available about half-way through Brett’s foundation program. He applied and was granted a position shortly before his program ended. With so much competition for MAP seats, Brett was chosen not only because of his excellent classroom performance but because of his work ethic (he was a full time student who also worked part time to gain experience as an electrician), as well as his mature attitude toward safety. He had thoroughly researched his industry prospects and identified the trade that would best meet his skill set and help him to obtain his future goals. “For such a young man, he presented himself in such a way that he inspired confidence in his ability to not only meet but exceed trade expectations,” says Trades department head, Joy Brown – a member of the hiring committee. Through his time in MAP, Brett will have the opportunity to work in at least three of Teck’s mines as he works his way through his apprenticeship. He is currently at Teck’s Greenhills Operations where he is gaining valuable hands-on experience to kick-start his career. When he’s completed his apprenticeship Brett is considering applying to SAIT to pursue further education as an instrumentation mechanic. Whatever the future holds for Brett, we’re sure it will be a bright one. We’re proud to be a part of his journey.